Why are kids fat? Toys. Or that’s one logical takeaway from a proposal by the Santa Clara County (California) Board of Supervisors. They want to ban Happy Meal toys and other promotions that attract children to high-calorie, unhealthy food. But is the ban itself obtuse? Why are kids fat? Toys. Or that’s one logical takeaway from a proposal by the Santa Clara County (California) Board of Supervisors. They want to ban Happy Meal toys and other promotions that attract children to high-calorie, unhealthy food. But is the ban itself obtuse? Supporters of the measure–parents, doctors, and public health administrators–pointed out that obese children turn into obese adults. One doctor, who runs a clinic focused on childhood obesity, said that he has a 5-year-old patient with type 2 diabetes, the L.A. Times reports. Those opposed to the measure included fast-food franchisees and other parents who noted that the promotions are often used as Christmas presents for poor children. It’s news to no one that kids like food that comes with toys, but taking the packaged deal away may make the actual meal less appealing. The proposal requires that meals with toys meet health and nutrition guidelines, but the ensuing chatter has left out the fact that McDonald’s already offers “healthy” choices with happy meals like milk, juice, and apple slices (though often with caramel dipping sauce). 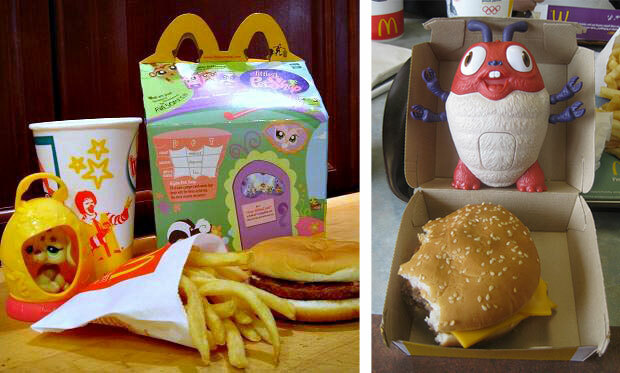 On one hand, parents, if you don’t want your kids eating Happy Meals, then don’t buy them Happy Meals. On the other hand, that’s easier said than done, especially when the occasional joy of a Happy Meal toy seems harmless compared to, say, getting shot in the crossfire of a gang battle on the walk home from school. The county’s five-member board voted 3 to 2 in favor of the ban, but will postpone implementing it for 90 days in hope that the fast-food industry will create a voluntary program to improve the nutritional value of children’s meals. It would extend only to unincorporated parts of the county, which includes much of Silicon Valley. If successful, maybe Santa Clara officials could treat themselves to some of IHOP’s new Pancake Stackers, two pancakes sandwiching a glob of cheesecake in a gastrointestinal three-way — the perfect compliment to a KFC Double Down.